We’ve received some great feedback from you with the latest patches, and we’re iterating on the Streamer Features and bringing in a new Key-based Event for you to enjoy. 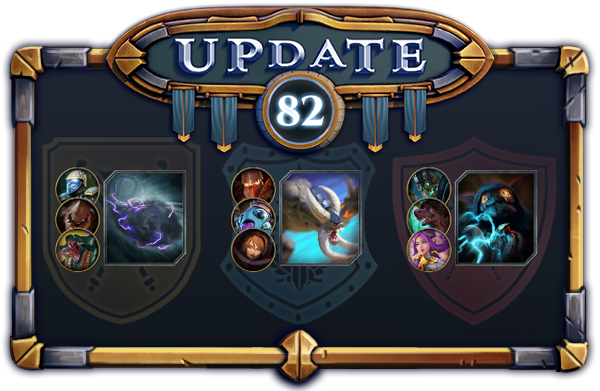 Let’s dive right in to what you can expect out of Update 82. House Valor: Stormy - If this cloudy little helper attacks your target, they’re in for a world of hurt! House Triumph: Charger - Charges into the fray with reckless abandon! It might not be the smartest minion around, though. House Glory: Mal'Shar - An assassin with a powerful electric fork. It's rumoured he killed a Storm Spirit to infuse it! The reward for opening the chest in the Card-House Contest is 2 copies of a random legendary card. We decided to move away from giving the chosen card for free as it caused a lot of frustration regarding how long it took Wheel of Doom to be implemented into the game, leaving a lot of the users that completed that previous event feeling they didn’t actually get their reward until months down the line. We’re planning for a January release of the winner of this event, but as always this can be subject to change. 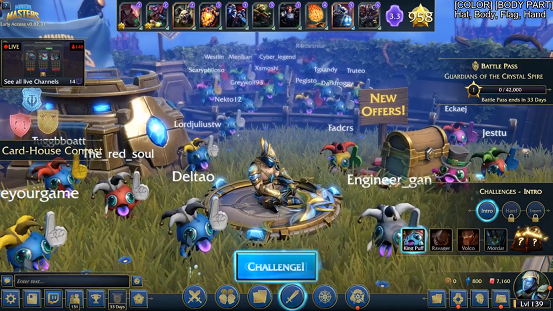 We’ve revamped the previous Streamer Arena to help set it apart from the Default arena a bit more - A couple of boxes really didn’t fit your grand twitch audiences, after all. Now we have a full stadium setup with proper seating available for your puffs to cheer you on from. The Streamer Arena will now be prioritized when queuing in 2v2. The Audience puffs' character limit has been increased to 12. Some known bots have been added to a blacklist so that they will not show up in-game. Added a /kickaudience [NAME] command to remove a puff from your audience. Viewers that donate bits to your stream through the "party" bit will have their name turn Golden until the Streamer exits the game. They will also be prioritised higher than other users to be a member of the Streamer audience if there are too many viewers to fit in the arena. The Jump command's animation has been redone. Increased the size of the card description text slightly. Fixed Rabid Prowler having Frenzy again. Fixed Dark Fury Storm Ranger's emissions being disabled. Fixed Brutish Betrayer being able to have the Turncoat buff twice. Fixed Emote previews being invisible. Fixed the Streamer UI avatars facing outwards. Fixed Crystal Stormbringer having snow on him in the Snow skybox. Fixed the Streamer Arena saying it would be available in future shop offers - Thanks Crabhead! Fixed an instance where taunts didn't properly redirect Minion attacks - Thanks Greywolf! Fixed the Emote tower being unusable for the rest of the match if you and a premade partner use the High Five emote - Thanks Julaiwnl! Fixed an issue where clicking on a spot in the Twitch Boost page would bring up the legal webpage - Thanks Crabhead & Omicron666! Fixed an issue where units that had their mana cost increased by Disruptor Puffs would not lose buffs gained from King Puff's second perk when they are returned to their normal mana cost - Thanks Julaiwnl! Fixed an issue where a unit can take a bridge and then not contest it when another unit steps onto it - Thanks Omicron666! Fixed an issue where Wizard Puff's polymorphed Mana Puff would start generating mana before it reached the bridge - Thanks Khazlariko! Fixed an issue where Milloween's attack delay would reset when all units within her range die, and then new units enter - Thanks Steven! Fixed 2v2 Mayhem only letting you see one opponent's deck - Thanks Omicron666! Fixed Blood Infested Settsu having the same ragdoll as the regular Infested Settsu - Thanks Elide! Fixed the Premium Upgrade still appearing to be purchaseable in the same session you bought it on Discord - Thanks Rosey! Fixed the "Get the game FREE" text being cut off - Thanks Hayazo & Excaliber80!